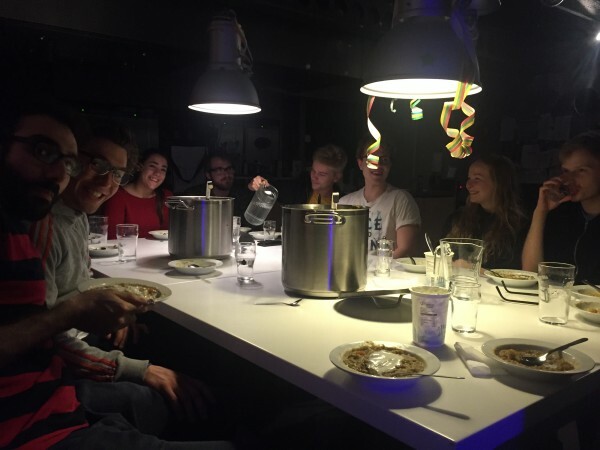 Common common dinners – a new Tietgen tradition? Three days a week we eat together in my kitchen, but the other day we tried something new: We had a ”common common dinner” with my neighboring kitchen. The idea came from Sari who I’ve gotten to know because he frequently walks past my kitchen on his way out. That way he got to know a lot of the people I live with, but it seems that even though our kitchens lie right next to each other, not many of us interact. Except from Sari, that is, and he wanted to change that. So, he invited us for a common common dinner so we could all meet each other. Him and I made daal for all of us, and the rule was that you were not allowed to sit next to someone from your own kitchen. Everyone was happy, the ambience was great, and no one felt like strangers. I hope we can do it again one day, maybe with another kitchen. The thing is, that even though you may see yourself as one of the more sociable residents here at Tietgen, there will always be a majority of the 390 people here that you don’t know – and they might be living right on the other side of the glass door that seperates kitchens. It’s so easy to make friends here, and even though we have many social events and traditions, there is always room for more. And so, we’ve hopefully started a new tradition making it easier to get to know someone who you may have heard of but never met. Tietgeners are not strangers, they’re friends you haven’t met.